So the sun has gone down, everyone is inside for the night, but they just can’t get enough snow? Its time to pull out the books on snow to continue with the fun after the sun goes down. The Cat in the Hat Comes back, Dr. Suess: No explanation needed, its just fun! Froggy Gets Dressed, by Jonathan London: Time to break out the Froggy voices on this one! Cliffords first snow day, by Norman Bridwell: Who doesn’t love a story about a mischievous dog? Thomas Gets a Snowplow , by Rev. W. Awdry and Richard Courtney: If you have a little boy, watch his eyes light up with this one. Frozen, by RH Disney : Ok, parents, lets face it, its part of the culture now. But at least we can read it to get a break from watching it. The Long Winter, Little House on the Prairie series by Laura Ingalls Wilder: You think we got a lot of snow? Don’t know how you will survive without milk? Puts it into perspective. Little Women, By Louisa May Alcott: Classic story about the joys of a family growing together. Seven Alone (On to Oregon!) By Honore Morrow: A True Story of survival for 7 Children who made it on the Oregon Trail after losing both parents. Does the new year hold a New Home for you? It doesn’t get any more luxurious than the community of New Brittany II in York PA. Close to everything, yet with a quiet setting. Ready to start? Its easy, come visit the open house this Sunday, 1-3pm, or call us today! What do buyers and sellers need to know to be smart about the housing market in 2016? Realtor.com® just released “Top Tips for Home Buyers and Sellers in 2016” to help guide house-hunters and home sellers on what’s most important for buying and selling a home this year. Here’s what they had to say. 1. Don’t wait. More than 85 percent of buyers who say they plan to buy a home in the next year say they will wait until the spring or summer of 2016, shows a recent realtor.com® survey. But buyers who start their hunt early will likely face less competition and have just as many homes for-sale to consider. 2. Shop around for a mortgage. Buyers shouldn’t take the first rate-quote they receive and should talk to more than one lender. A lower interest rate could equate to thousands in savings over the life of the loan. Mortgage rates are largely expected to rise over this year. Realtor.com® is predicting mortgage rates to reach 4.65 percent by the end of this year (they’re currently just under 4 percent). 3. Don’t discount buying new. New-home construction is expected to surge this year, with an expected 16 percent increase in new home sales year-over-year. Buying new most likely means less competition and a wider selection of homes. But a caveat: New-homes typically cost more. Realtor.com® predicts the following markets will dominate with new-home sales this year: Boise City, Idaho; Charleston-North Charleston, S.C.; Salt Lake City; Nashville-Davidson-Murfreesboro-Franklin, Tenn.; and Myrtle Beach-Conway-North Myrtle Beach, S.C.-N.C.
4. Buy in the Midwest or South. The Midwest and South will likely offer the most affordable options for home purchasers in 2016. Realtor.com® singles out the following markets as offering buyers high affordability, rising inventory, and some of the most favorable lending standards: Dayton, Ohio; Birmingham-Hoover, Ala.; Harrisburg-Carlisle, Penn. ;Augusta-Richmond County, Ga.-S.C.; and Des Moines-West Des Moines, Iowa. 1. List during prime-buying season. Realtor.com®’s data shows that the prime home buying season usually begins in April and reaches a peak in June. “Sellers who list their home during the prime spring and summer months benefit from a larger population of buyers and potential bidding wars, which often result in higher prices and faster closings,” according to realtor.com®’s report. 2. Price to sell. Home prices nationwide are expected to rise 3 percent year-over-year, with a few markets like Stockton, Calif., and Las Vegas expected to see a whopping 10 percent increase this year alone. Home sellers would be wise to take their local REALTOR®’s advice to price their home adequately for the market and based on comparables. 3. Consider an incentive. Is there something extra a seller could throw in to entice buyers? Sellers who are open to negotiate beyond just price may find more success in hooking a buyer. Thirty-seven percent of all sellers offered some type of an incentive last year. 4. Sell in California. The Golden State is being singled out as having the most markets that will likely tilt in sellers’ favor this year. Job growth, rising home prices, and limited inventories are boosting housing markets in the state, most notably in Stockton-Lodi; Bakersfield, Calif.; Fresno, Calif.; and San Jose-Sunnyvale-Santa Clara, Calif., according to realtor.com®. Help for Homebuyers is here! Dreaming of a White January? 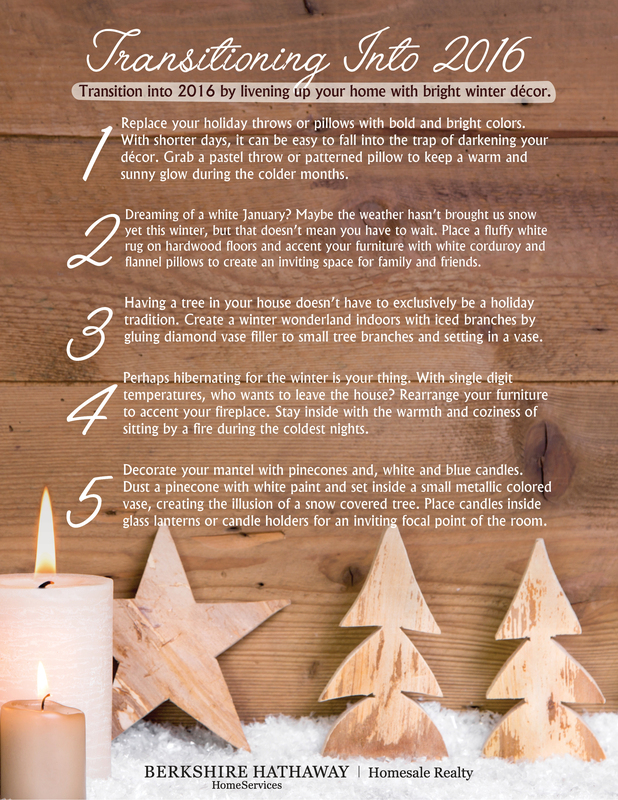 Great ways to make your home still feel ‘homey’ without the Christmas decorations!